Logan’s surprised when the Silverspoon Twins invite Java and him to their birthday party. They say it’s going to be the biggest, most incredible party ever. The local newspaper is even going to send a reporter to cover it! But Logan knows one thing for certain—he better come up with a really good present, or he’ll never hear the end of it. When the boys get to the party, it’s a full-blown carnival. And even though Logan’s warned Java to act normal (which is pretty hard for a robot), there’s a lot that can go wrong . . . and it does! And worse, the reporter seems to have noticed. Logan’s worried that she’ll find out his cousin’s secret! As the reporter starts asking all sorts of questions, Logan announces that all of Java’s feats of strength and shock are just an illusion, and launches into an impromptu magic show with his amazing assistant, Java, to throw her off the trail. But will Logan be able to make this whole mess—Abracadabra!—disappear, before Java’s big secret becomes headline news? 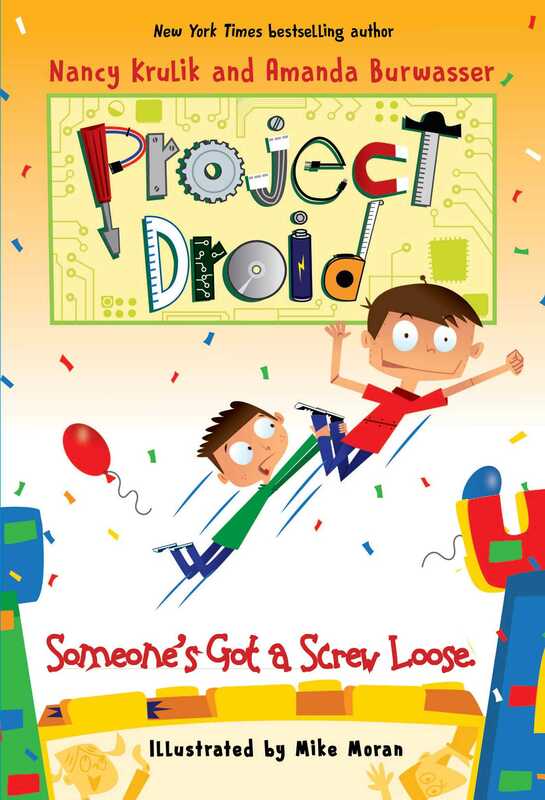 International bestselling author Nancy Krulik and her incredibly talented daughter, Amanda Burwasser, spin hilarious high jinks in the sixth book in the Project Droid series, which combines the literalness of Amelia Bedelia with a wacky modern edge, making for hours of laughter. And the fun continues with an activity in the back! Amanda Elizabeth Burwasser holds a BFA with honors in Creative Writing from Pratt Institute in New York City. Her senior thesis, a screenplay entitled Born to Me, earned her the coveted Pratt Circle Award upon graduation. This former native New Yorker is now a preschool teacher, residing in Forestville, California. Mike Moran is a dad, husband and illustrator. He has worked for really fun clients and his illustrations can be seen in children's books, animation, magazines, games, World Series programs, and more. He often dreams of playing first base for the New York Mets, being a songwriter in Nashville or the 5th Beatle. He lives in Florham Park, New Jersey. "[F]unny enough to keep fledgling readers turning pages." —Kirkus Reviews on Science No Fair!